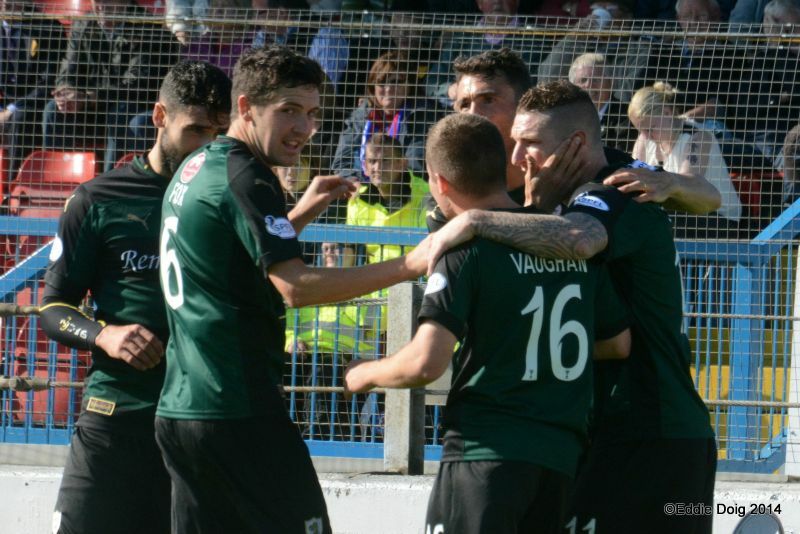 Raith steadied themselves after two consecutive defeats with a hard-worked but fully deserved victory at Fife neighbours Cowdenbeath, winning 3-1 with goals from Mark Stewart, Lewis Vaughan, and a fine free-kick from Ryan Conroy. 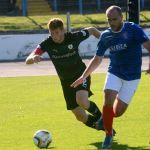 For Cowdenbeath, the hosts remain rooted to the foot of the Championship table, today’s defeat coming soon after another heavy home loss to Alloa. For Raith though, with the focus on regaining stability after conceding eight goals in their previous two outings, today’s win leaves Raith comfortably in the top half of the table heading toward the break for international fixtures next week. Grant Murray can be especially pleased with the way his team and coaching staff coped with a flurry of injuries in the run–up to the game. Christian Nadé missed out having failed a late fitness test, and goalkeeper Kevin Cuthbert was named on today’s teamsheet but fell victim to injury before kick-off. With the game only five minutes old, defender Ross Perry also had to be withdrawn with a twisted knee, Laurie Ellis coming on to play almost the full 90 minutes. 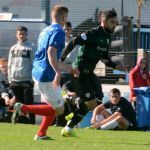 Therefore, it was a somewhat patched-up Raith team took the field, resplendent on a bright day in the club’s green away jerseys. 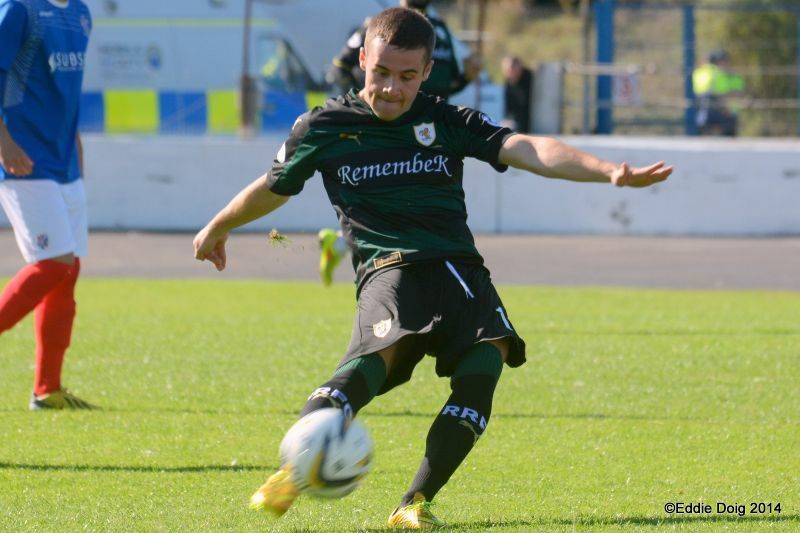 Mark Stewart was the furthest forward, supported by Lewis Vaughan, with Mark Scott and Ryan Conroy in the wide positions. 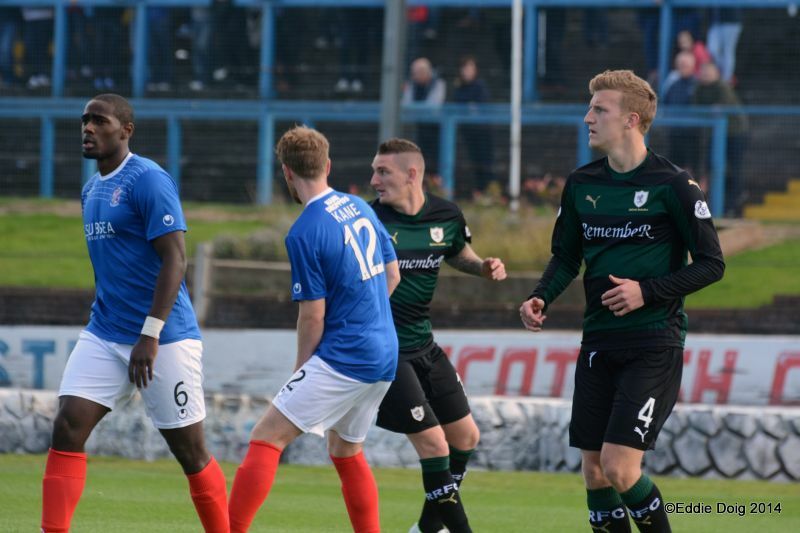 Cowdenbeath fielded their new on-loan signing – Dundee United’s Kudas Oyenuga. 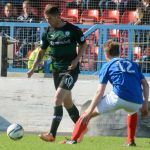 The loanee’s impressive frame suggested he would be a handful, and within two minutes of the start, Jason Thomson felt the full force of the athletic striker in full flight. 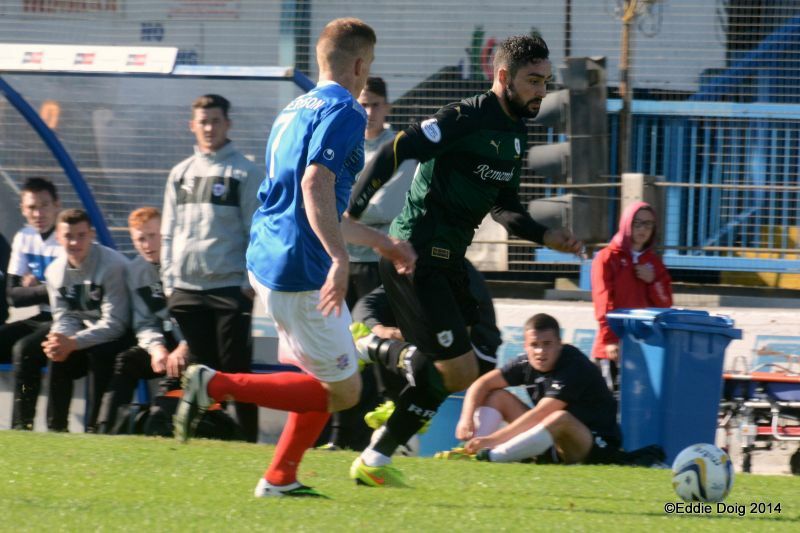 Cowdenbeath have lost strikers Kane Hemmings and Greg Stewart over the summer. 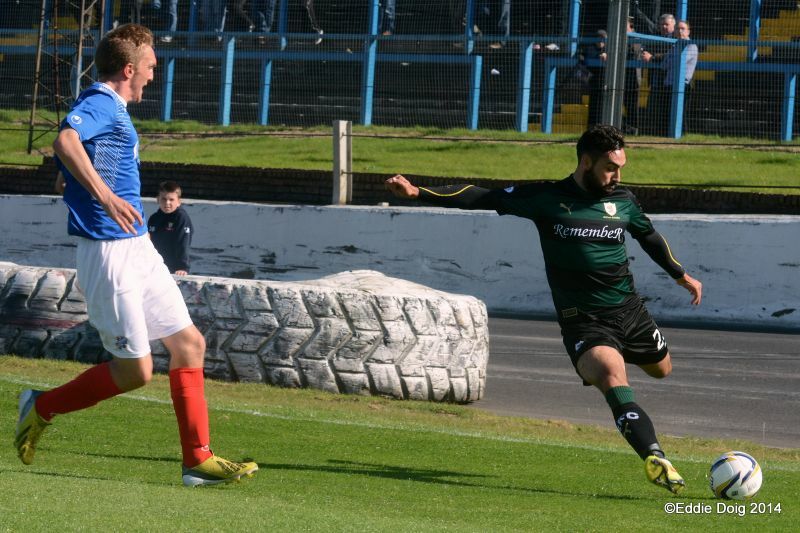 With Raith’s Nadé out before kick-off, supporters may have wondered where today’s goals were going to come from. The early stages justified those concerns, with few goal-mouth chances. Fox had an early glimpse of goal, with home captain Wedderburn booting clear. 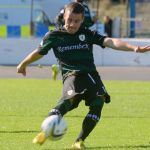 The first real chance for Raith came after fully fifteen minutes – Fox, Watson, and McKeown patiently controlled possession before the full-back zipped a ball through for Stewart to chase. 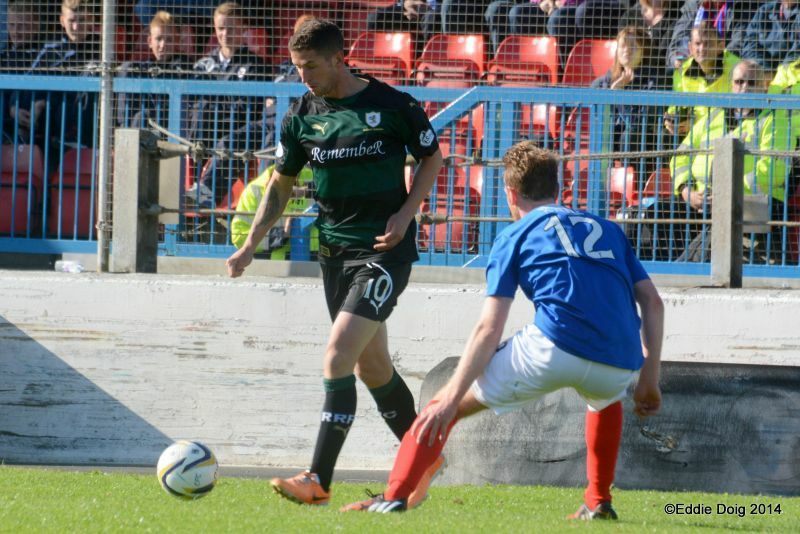 Cowdenbeath keeper Flynn collected from the feet of the Raith forward. 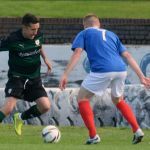 Grant Murray had opted to start with last season’s central midfield pairing of Kevin Moon and Liam Fox, and the pair’s understanding was clear from the outset. The visitors won the majority of the loose balls in the central third, Moon in particular distributing the ball efficiently and with purpose. 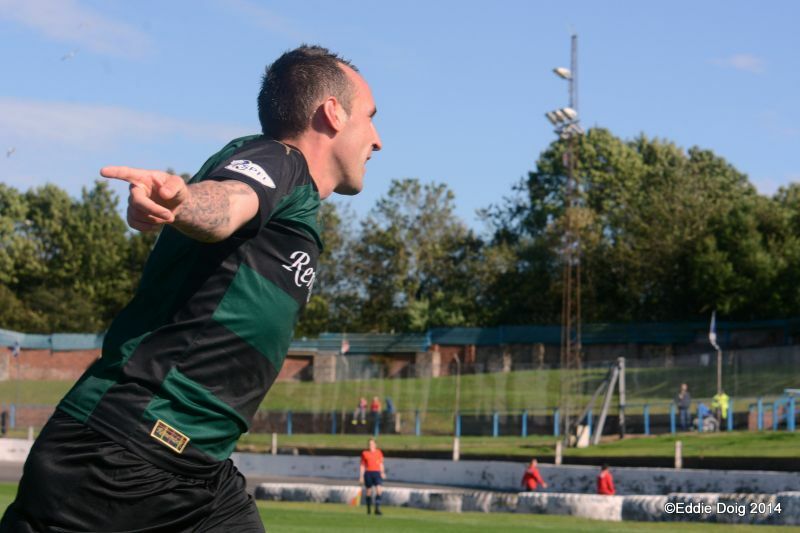 Although forward forays were rare, the pair gave Raith a firm foothold from which to build. 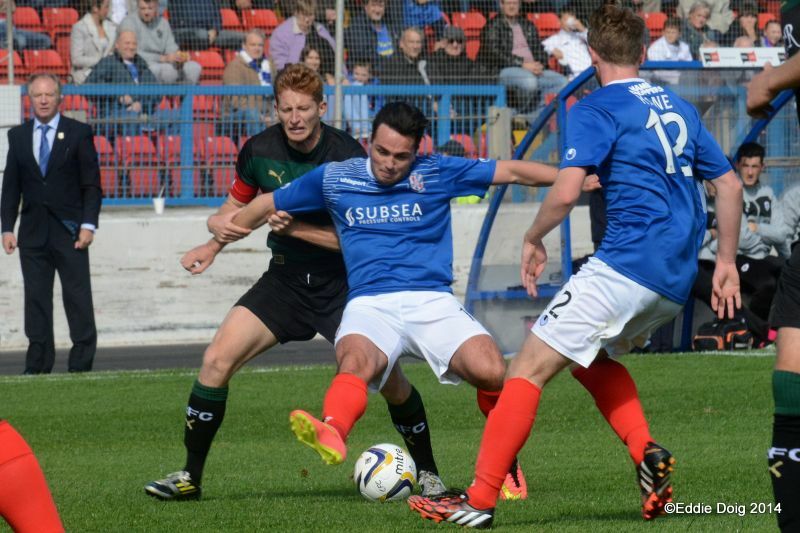 Cowdenbeath struggled to develop any possession of note in the first half as a result. 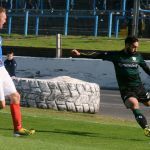 Winning numerous tackles and covering every blade of grass, Moon put in a man-of-the-match performance, the central pillar around which his team-mates laid the foundations for Raith’s victory.Having said that, when Cowdenbeath played the ball forward quickly, they caused problems. Oyenuga battled inside Thomson but fired well wide, a Milne shot flew over, and Campbell created space for Kane again to blast high into the terracing behind Raith keeper Laidlaw’s goal. With a strong breeze against them, Raith were seeking to play patient possession, waiting for opportunities to spring Stewart or Vaughan. Although several of the away support barracked for long aerial balls, the less frantic approach was unquestionably the more mature option. With Raith controlling most of the midfield areas, Murray’s men were wise to wait until gaps appeared, rather than to sacrifice possession with more direct deliveries from back to front. One such opportunity brought the opening goal on the half-hour. 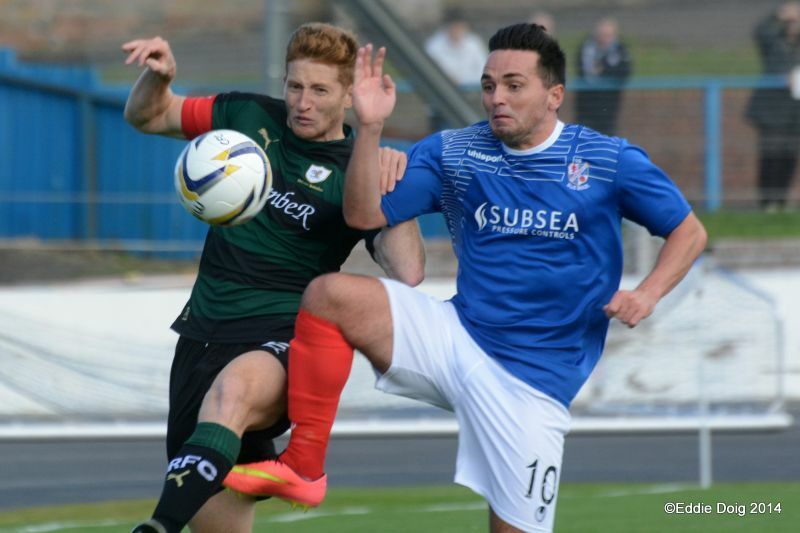 With Cowdenbeath having committed men forward, Moon won a superb tackle and fed Conroy. 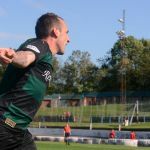 The midfield’s lofted pass held up in the wind, with Stewart setting off like a whippet, showing great strength and composure to hold off Wedderburn and fire a powerful shot beyond Flynn into the roof of the home net. Although few clear-cut chances had been created, the balance of play suggested Raith were well worth their lead. Cowdenbeath captain Wedderburn limped off before the restart, with Kane dropping into defence with substitute O’Brien filing into midfield. 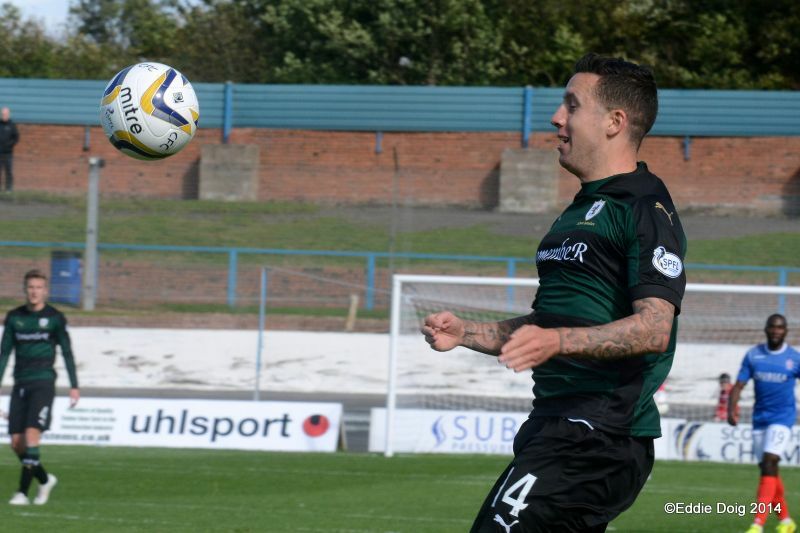 Raith’s goal served to develop the visitors’ confidence. Scott’s lofted drive fell narrowly over after Flynn punched weakly at a McKeown cross, Stewart hared after another through-ball only for Kane to stretch out a despairing leg, and Flynn managed to hold a rasping Conroy shot following a sharp turn. The midfield was becoming heated. With referee Kevin Graham seeming to want to let the game flow, several strong challenges went unpunished. Both sets of fans found their voices as midfielders on both sides went uncompromisingly about their business. One moment of concern came for Raith shortly before the interval following a high Flynn clearance – with Laidlaw, Fox, Watson, and Oyenuga all in attendance, it was Raith midfielder Fox who came off worst, requiring treatment for a head knock. 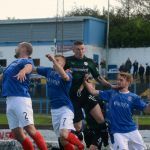 Referee Graham waited before halting play – with Cowdenbeath in an attacking position, the home crowd were none too pleased at the stoppage. 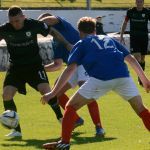 Both sides’ styles of play changed as the second half began – Cowdenbeath looked to get the ball forward far more quickly than in the opening half; Raith, with the stiff breeze at their backs, seemed content to sit and hit long angled clearances for Vaughan and Stewart to chase. For the ten minutes following the break, Raith had the better of it. Vaughan had an early turn and shot just wide. In fifty-three minutes, McKeown’s deep cross was angled back across goal by Scott, and as Stewart unleashed a goal-bound drive, only Kane’s block turned the shot over the bar. Vaughan jinked clear on two other occasions, Flynn racing from his line to block or clear to safety. On the hour, Jimmy Nicholl shuffled his cards and threw on a third striker, Kyle Miller being withdrawn and Craig Johnston joined Oyenuga and the hitherto quiet Higgins upfront. Within moments, the home side’s best chance nearly produced an equaliser. Laidlaw charged from his line but punched unconvincingly, Johnston’s shot unluckily hit Oyenuga, and Higgins’ drive was cleared by Watson and Ellis with Laidlaw yet to regain his ground. 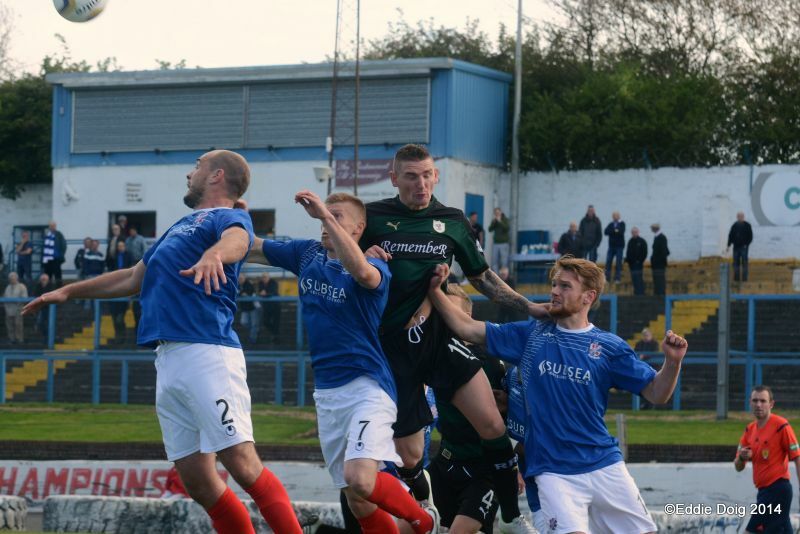 With the change, Cowdenbeath seemed to acquiesce in Raith’s midfield superiority, but sought to capitalise with greater numbers pressuring Raith’s back four. 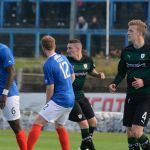 Johnston greatly improved Cowdenbeath’s mobility upfront, with his vitality spurring renewed effort from Oyenuga and Higgins. A flick from the latter found Milne on the run with sixty-five minutes played, only for Thomson to cause the move to break down. With the home crowd enjoying the favourites’ best spell in the match, the muscular Oyenuga twisted and turned, with only a combination of Watson and Ellis bundling the ball to safety. 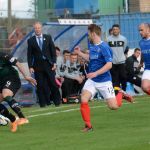 Given the windy conditions – the match was appropriately sponsored by the developers behind the Little Raith windfarm – Laidlaw was able to put Cowdenbeath’s back four under immediate pressure with hefty clearances. Flynn turned one over his own bar, and had to stretch to collect another mortar launched by his opposite number. 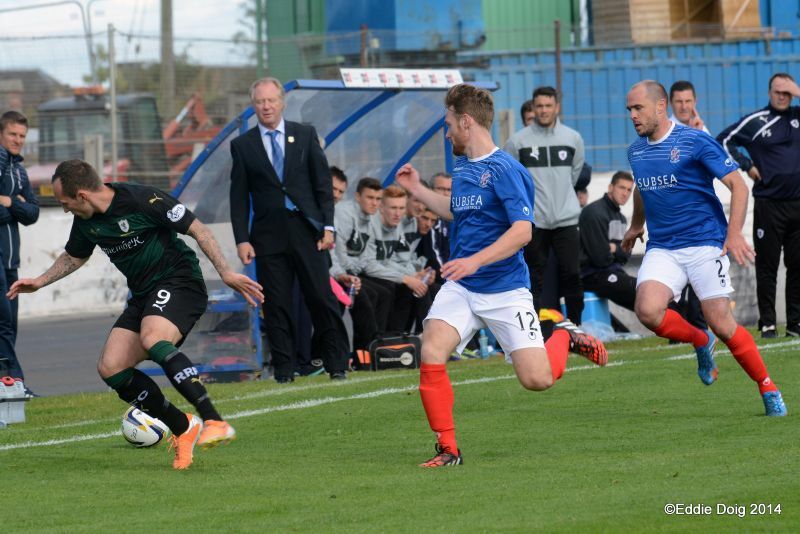 Jimmy Nicholl’s attacking substitution gave Raith clear supremacy in the midfield, and space to run into. With twenty minutes remaining, Raith put the game beyond doubt with a fine goal. Scott, tripped by a retreating Milne, took a quick free-kick feeding Stewart. 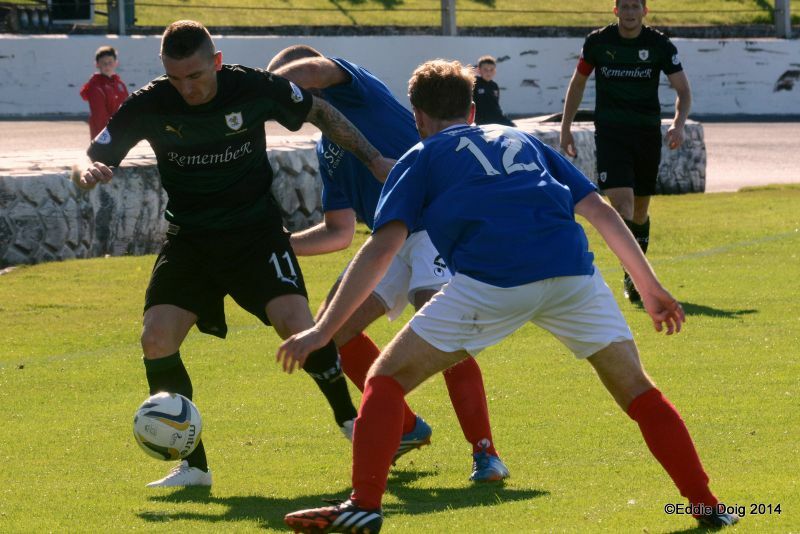 The Raith striker had space and time to cross; although outnumbered in the box, Vaughan’s perfectly-weighted header back across Flynn doubled Raith’s lead. With quarter of an hour to go, Raith’s two-goal lead became three. 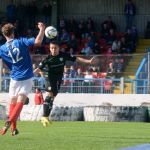 Following a trip in midfield, Conroy lined up a free-kick from fully thirty-five yards, controlling a curled shot perfectly beyond Flynn. 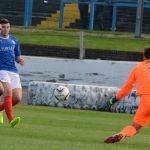 With a blustery wind, Conroy’s control with the dead ball was exemplary, catching the Cowdenbeath keeper by surprise with the pace and precision of his finish. Within a minute, the Raith winger had another free-kick chance, arguably from a better position. This time Flynn was alert, clutching the dipping drive from Conroy’s cultured left peg. Further chances followed. 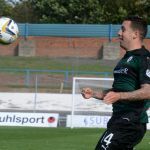 Vaughan was withdrawn for Calum Elliot, and straightaway the former Tynecastle forward was released by Fox through on goal, but failed to connect with the through-ball. Cowdenbeath’s back two of Brownlie and Kane were tiring by the end, stretched this way and that by Raith mobility in the final third. Full-backs Campbell and Brett struggled in the second half with the directness of Vaughan and Stewart, with Conroy and Scott following up. 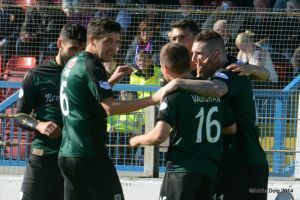 With the wind at their backs, and as they had looked in the opening league fixture against Dumbarton, Raith appeared more likely to score as the game progressed. The one black mark in an otherwise commendable performance was the loss of a late goal. Again as with the Dumbarton victory on the opening day, Raith’s midfield lost concentration in the closing stages. 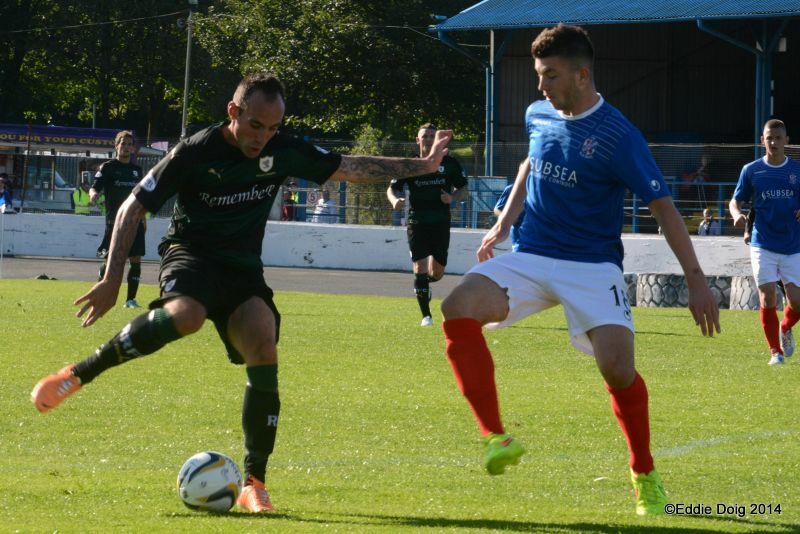 Cowdenbeath’s Milne dispossessed Moon and beat Laidlaw with a fine driven finish in injury time. 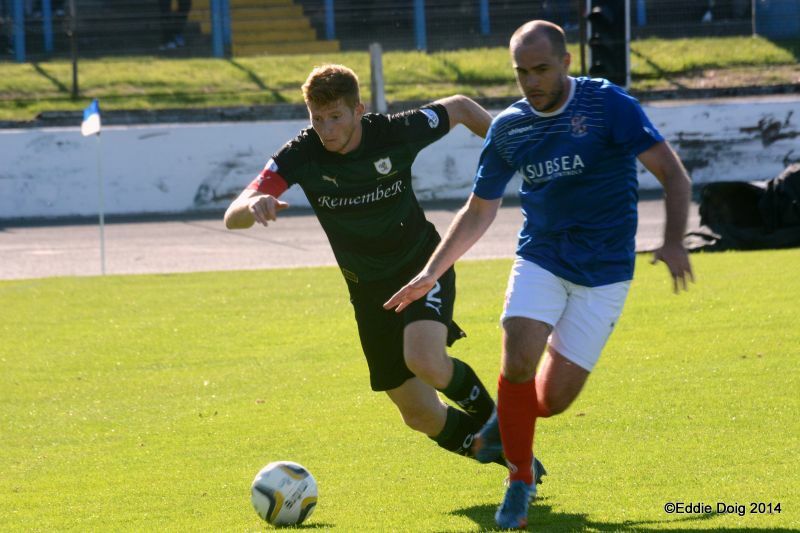 A solid victory and a deserved three points in the bag, Raith can look forward to a week of recuperation before a first meeting of the season with last year’s Ramsden Cup finalists Rangers on Friday September 12th. With three players injured today, the break couldn’t come at a better time for Grant Murray, as his side build toward another stern test of their Championship credentials. Welcome to Central Park, it's 17 degrees and overcast. late news. Cuthbert injured during warm up. Laidlaw starts. Stewart struggling to get onto the game. doesn't suit being a lone striker. Rovers break and it breaks down. Fox long pass almost through to Stewart. was cut out at the last moment by Kane. Vaughan with options decided to shoot, his effort going way over the bar. Consternation in the crowd as Oyenuga brings down Stewart. Lewis going on a solo run is intercepted in the box by Brett. Vaughan denied a goal by a lunging Kane in the box. Lewis through again, this time Flynn rushing out of his area to clear. Vaughan once more shooting just past the post. From a corner Conroy fires just over from inside the box. Cowdenbeath get into the Rovers half, Laidlaw comes out and it is left to Watson and Ellis to clear off the line. With the wind at his back Laidlaw nearly scores with a clearance, forcing Flynn to tip over. Laidlaw is on fire, another clearance and Flynn again forced into a save. Oyenuga cleverly backheels to Milne but Thomson intercepted and clears. Scott with the hard work lays off to Stewart who provided a pass to Vaughan his looping header beat Flynn at the near post. Goal Rovers. Brett running forward passes 30 yards to Oyenuga who lost out to Laidlaw for the ball. Conroy with a 35 yard free kick straight into the postage stamp corner. Goal Rovers. Conroy free kick, this time from 25 yards is saved by Flynn. Fox almost through on goal courtesy of a clever back heel from Stewart. Correction, Elliot not Anderson on. Conroy frees Elliot who stumbled going in on goal. Cowdenbeath trying to get a consolation. Fox off, definitely Anderson on. O'Brien trying a looping chip into the box, Laidlaw coming out to gather. +2 Moon lost the ball in midfield allowing Milne through to score off the underside of the bar. 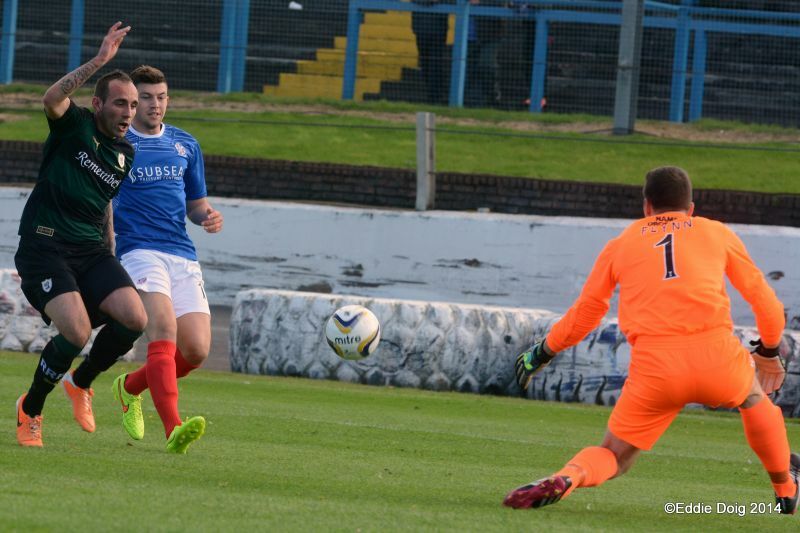 Goal Cowdenbeath. Flynn, Campbell, Wedderburn, Robertson, Milne, Higgins, Kane, Brett, Oyenuga, Brownlie, Miller. Subs, O'Brien, Jurisic, Johnston, Lynas, Wright, Callaghan, Thomson. Cuthbert, Thomson, Perry, Watson, Fox, Moon, Stewart, Scott, Conroy, Vaughan, McKeown . Subs, Anderson, Elliot, Callachan, Ellis, Matthews, Bates, Laidlaw. Mark Stewart waits for the ball to catch up. Jimmy Scott wins the header. 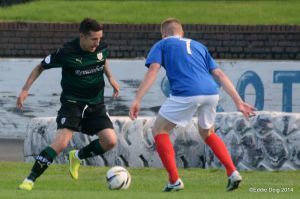 Flynn beats Stewart to the ball. Conroy keeps his eyes on the ball. Dean Brett fouls Lewis Vaughan. 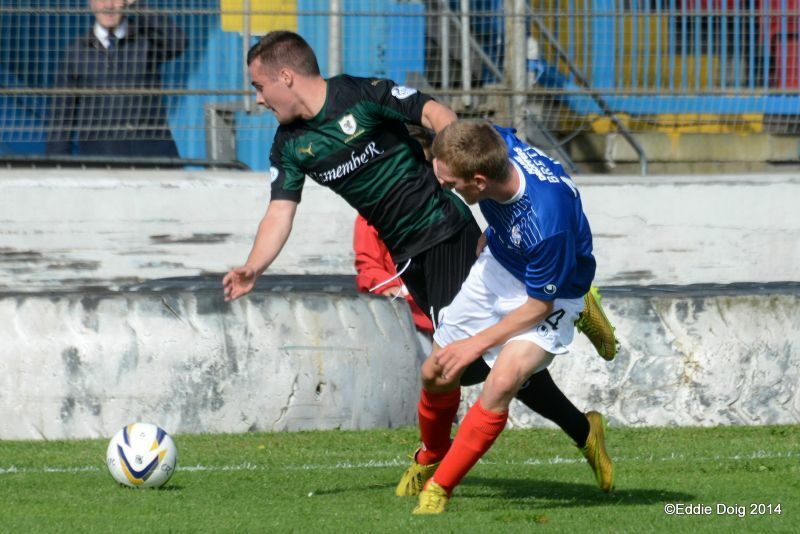 Cowdenbeath clear in the nick of time. Rory McKeown sens in a cross. Captain Jason Thomson flies down the wing. 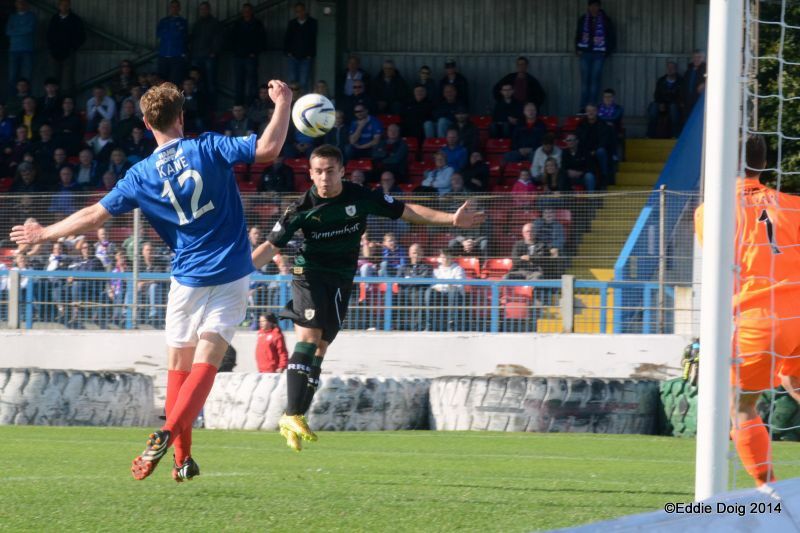 Lewis Vaughan heads home the second. Raith celebrate the third goal. Calum Elliot came on late in the game.